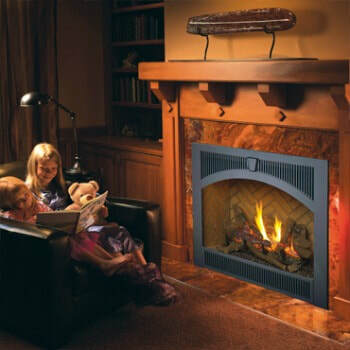 Gas Burning Fireplace | 864 TRV Gas Fireplace is fantastic for warming outdoor spaces & small to mid sized homes. The 864 TRV is also great for heating bed and living room spaces. This unit sports an ultra clear glass that comes with the ANSI-compliant safety screen. This safety screen boosts the safety of the unit for your family. An ambient accent light is also included in the unit. 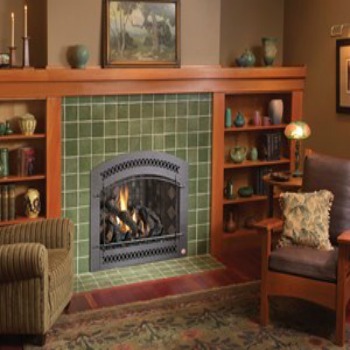 This light brilliantly showcases the fireplace regardless of if the unit is off or on. Consider adding the optional GreenSmart™ 2 Wall Mounted Remote Control for total control of the fireplace from the convenience of your favorite chair. You may also add the Power Heat Duct kit that helps distribute heat into an adjacent room. ﻿*All measurements and colors are approximate, contact Bare's for details. Specifications may change without notice. Please note Bare's Stove and Spa strives to update manuals and information as they become available. These are for reference only; the latest documentation by the manufacturer takes precedence. Please visit Bare's for color options, dimensions and additional information.